Just perfect and delicious as written, though I didn't bother with skewers since I only made enough shrimp for hubby and myself. No need to change a thing, unless you feel some compelling desire to do so. 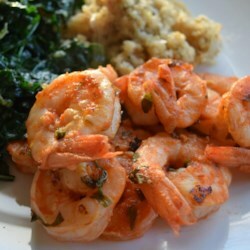 Just enough flavor and seasoning--enough to be noticeable, but in a way that enhances the shrimp rather than overpowering its own wonderful and delicate flavor. This is an example of how using a few simple but flavorful and fresh ingredients is usually best.